I promised you a few images from the book, so here they are. I hope they’ll give you the gist of what this latest tome is all about. I want to share my love for legumes, I really do think that they’re one of the most satisfying and delicious ingredients in the kitchen. It’s not about persuading you to eat them because they are incredibly healthy, economical, sustainable, easy to cook and infinitely versatile (obviously quite a few bonus points too) it’s all about how very, very tasty they are. Pulses have at last emerged from their tie-dye teepee, so ditch all those hippy preconceptions and dive in. I can think of nothing better than tucking into a slow-roasted shoulder of lamb with flageolet beans or some roasted autumnal roots with chickpeas and pomegranate molasses. Yes, it’s all about comfort today; it’s peed with rain all afternoon, I’ve had my SAD lamp on next to the desk it’s been so dark and desperate. Dahl is one of my favourite simple supper dishes. You can serve it alongside a curry but I’m just as happy to eat it alone with a bowl of rice or an Indian flat bread. 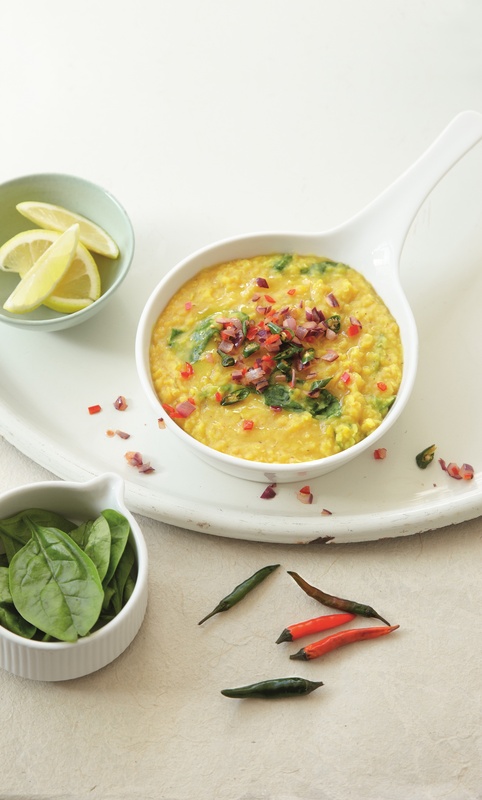 Stir a spicy Tarka and a few spinach leaves into the dahl at the last minute and it’s fabulous. I’m not a veggie but I could happily eat this at least once a week. 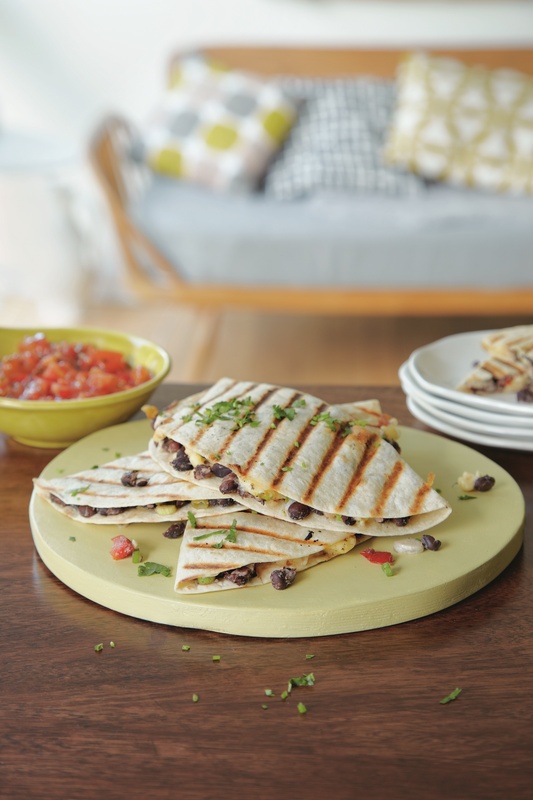 Black bean quesadillas are really quick to make especially if you use tinned black beans but I must encourage you to boil up a big pot of beans and then use them for a selection of recipes, vary the dishes enough and no one will ever notice that they’ve eaten the same bean three times in one week ( you can freeze any left over beans too). So take black beans for example: you could have Mexican quesadillas on monday, followed by black bean, squash and sweetcorn soup on wednesday and indulge yourself by making black bean brownies for the weekend. I prepare lentil salads year-round, you can top them with whatever’s in season. 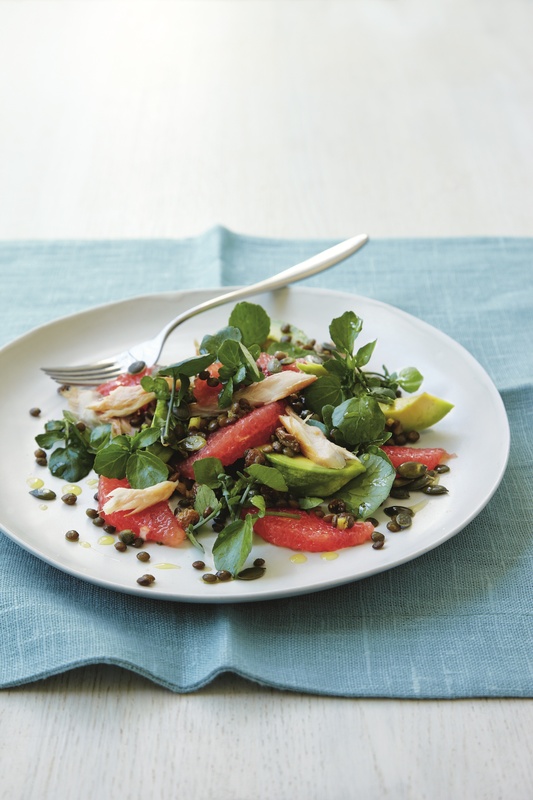 This smoked mackerel, grapefruit and lentil salad is a wonderful, zippy winter salad. It’s great when your feeling a bit sloth-like and sluggish because it’s packed with vital vitamins and omega 3. There are plenty of other legumey salads as well. They’re particularly good for lunch boxes; where a leafy salad wilts a pulse just soaks up the juices and develops in flavour. 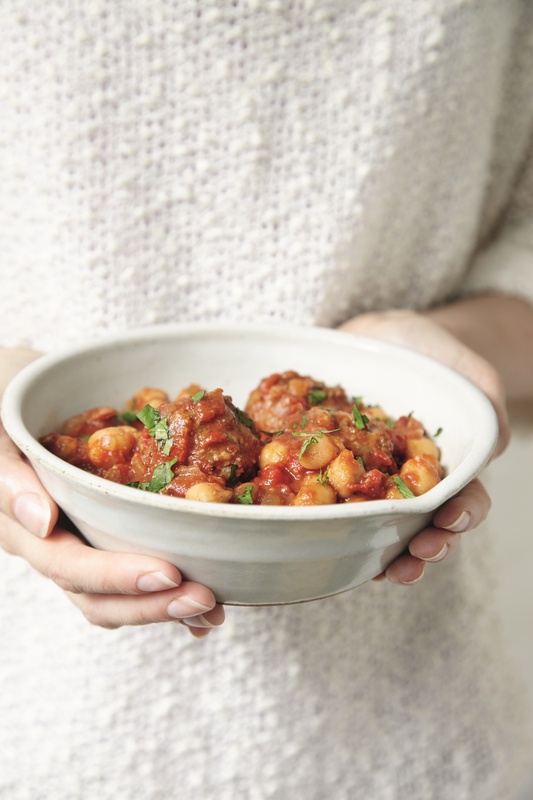 These Moroccan chickpeas with meat balls are a family hit and a great reminder to all those doubting carnivores that legume dishes don’t necessarily have to be vegetarian. Cassoulet, Chilli con carne and Boston baked beans are all classics but there are plenty of other dishes such as Pot roast pheasant with prunes and lentils to get your teeth into too. Now I do promise that you’ll have a recipe in my next post, I have a tray of figs lurking downstairs and a wonderful recipe to prepare. Meanwhile I hope you’ll enjoy Clare Winfield’s amazing photography and excuse me for banging on about my book yet again.